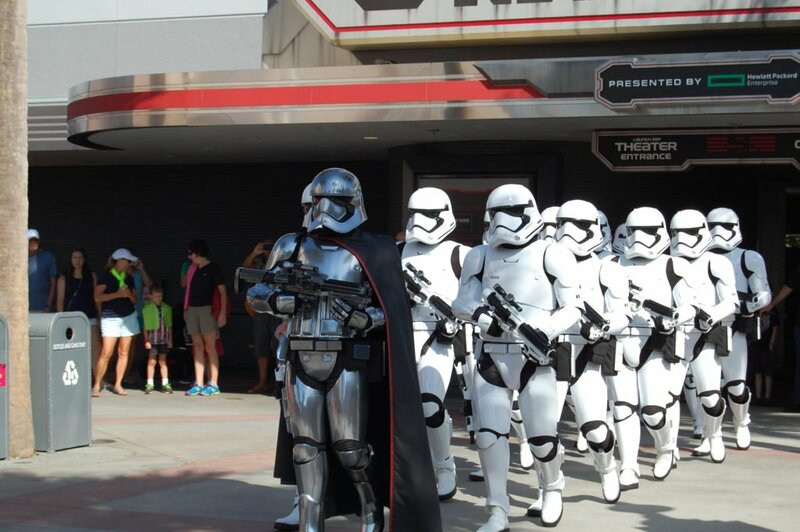 Disney recently made Star Wars fans very happy by announcing a huge expansion to Hollywood Studios dedicated to Star Wars. While it will still be several years before Star Wars Land is complete, Disney has added many Star Wars related things into Hollywood Studios in the last year or so. Here are 10 magical must-do’s for Star Wars fans. I will update this article to include new elements once the construction is completed and the new attractions are open. Star Tours is the oldest Star Wars attraction in Hollywood Studios, but it has been updated several times in recent years. It is a 3-D motion simulator in which you board a StarSpeeder 1000 and travel to multiple locations from the Star Wars movies. Many favorite characters from the franchise make appearances in the attraction. The locations that you visit are random, so you can potentially travel to new planets with each ride. I will caution you, however, if you are bothered by motion simulators, you may want to sit this one out. It is quite rough at times. This ride is so well done that my son, Boston, has a hard time distinguishing the difference between fantasy and reality when he rides it! I recently wrote an entire article about Jedi Training. It is a great opportunity for little fans to become part of the fight against the Dark Side. 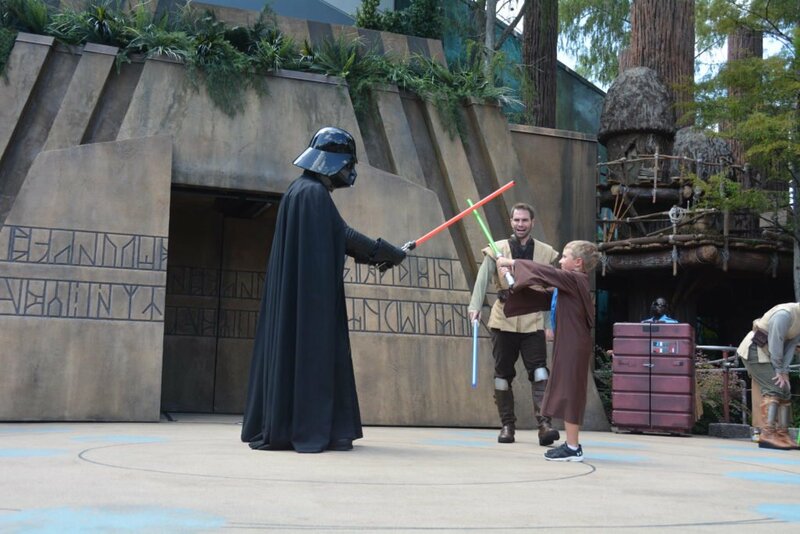 Children ages 4-12 can sign up for Jedi Training and then fight either Darth Vader or Seventh Sister. This is a fun little show which is performed about 15 times per day on a small stage next to Star Tours. There are Photopass photographers there to get some great shots of your kids at they go through their training. It is a lot of fun. 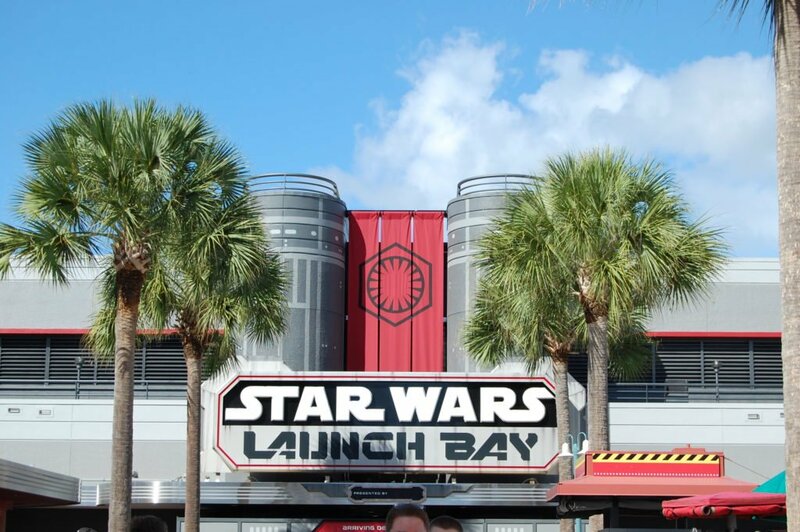 Disney added Star Wars Launch Bay to Hollywood Studios in December 2015. It is located in the Animation Courtyard area near the Disney Jr. Live On Stage show. Launch Bay gives you a rare chance to get up close and personal with some props and models from the various movies. Star Wars fans can spend hours in here looking at everything. There is a store here, too, where you can find some great Star Wars merchandise. My husband and son loved walking through all of the exhibits. We love meeting characters while at Disney World. 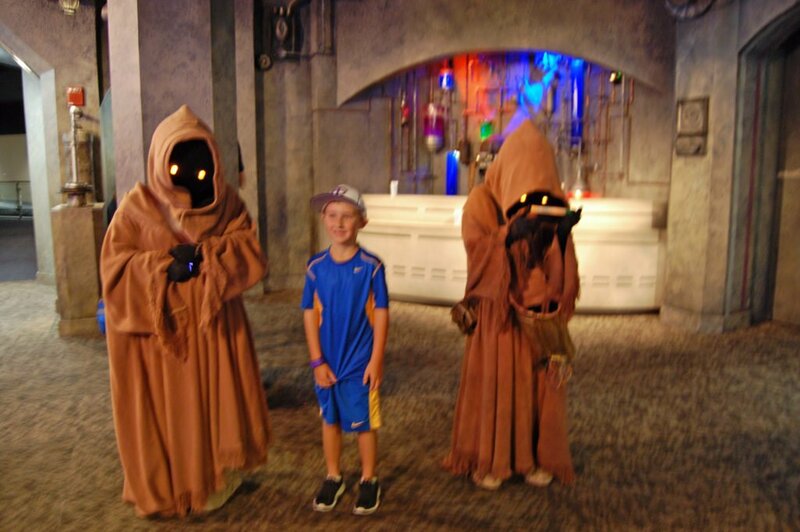 Before we met Kylo Ren, he was Boston’s favorite Star Wars character. Afterwards, Boston thought differently about him. He was, by far, the creepiest character we have ever met! None of us really wanted to get too close to him! He is so believable! 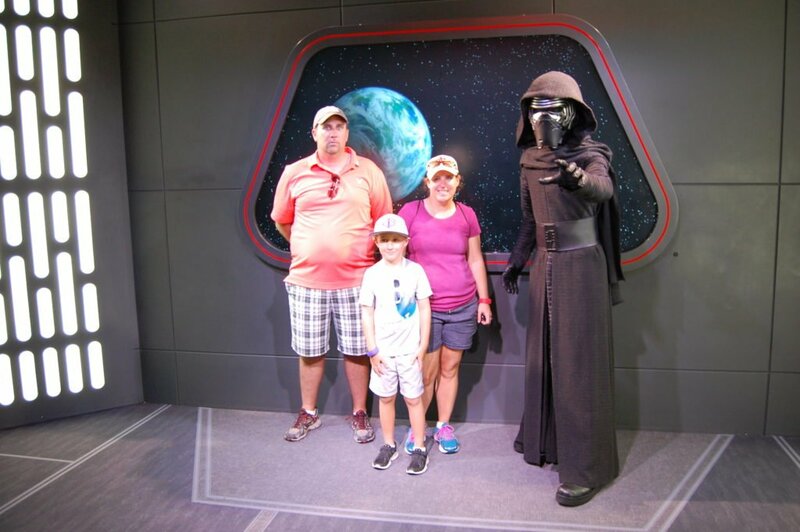 Even if you are not a big fan of meeting characters, you should take time to have a picture made with Kylo Ren if you love Star Wars. It is an experience not to be missed. 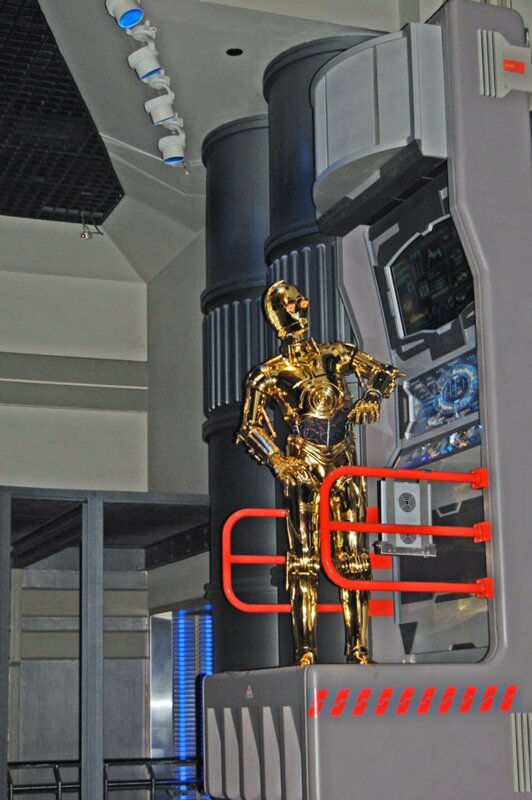 You can find him inside of Launch Bay. 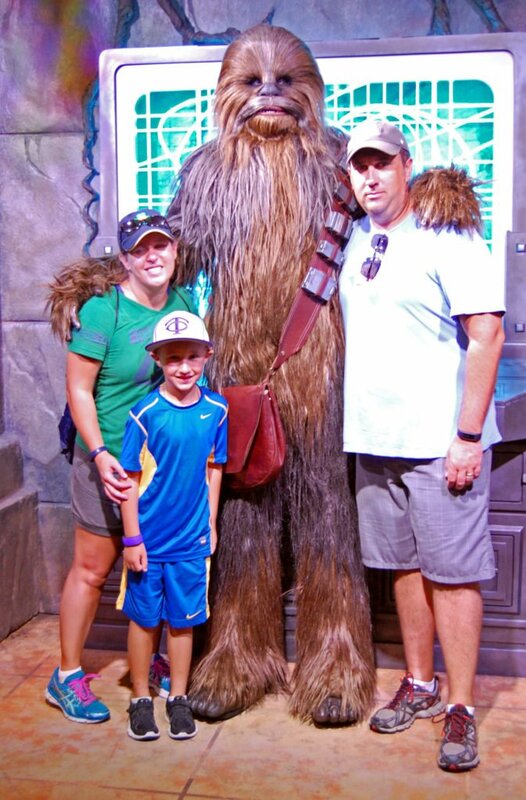 You can also find Chewbacca inside of Launch Bay. He is in a separate area from Kylo Ren and has a separate line. While he is not spooky like Kylo Ren is, he is quite realistic. He is very tall! He is a fun character to meet, even if you are not a fan of Star Wars. Usually, his line is not as long as Kylo Ren’s, so I would suggest meeting him after Kylo Ren. Periodically throughout the day, Captain Phasma and a platoon of Stormtroopers march from Launch Bay to the central stage located in front of the Chinese Theater. After a short show there, they then march back to Launch Bay. While we didn’t watch the stage show, we did watch the march several times on our last trip. Boston thoroughly enjoyed it. Throughout the march, Captain Phasma makes comments to the crowd and the Stormtroopers as if they are on an official mission. This is a fun little distraction which will only take a few minutes of your day. It is a great time to get some close-up photos of the Stormtroopers too! This is a fireworks show that also has lasers, projections, and fire, all set to the iconic music of Star Wars. The screens for the projections are the Chinese Theater and the surrounding buildings. It is one of the best nighttime shows I have ever seen! Chris is not a fan of fireworks, and he was blown away by this show! It is simply incredible! Words can’t do it justice. Unfortunately, this fabulous show is going to be ending in November. Hopefully, Disney will bring it back, either in its current form or a better one, once Star Wars Land opens. Update: I recently learned that this awesome fireworks show will be coming back to Hollywood Studios on December 16 and will be continuing into 2017! If you have a trip planned soon, I highly recommend taking time to see this show, regardless of whether you are a Star Wars fan or not! It is amazing! 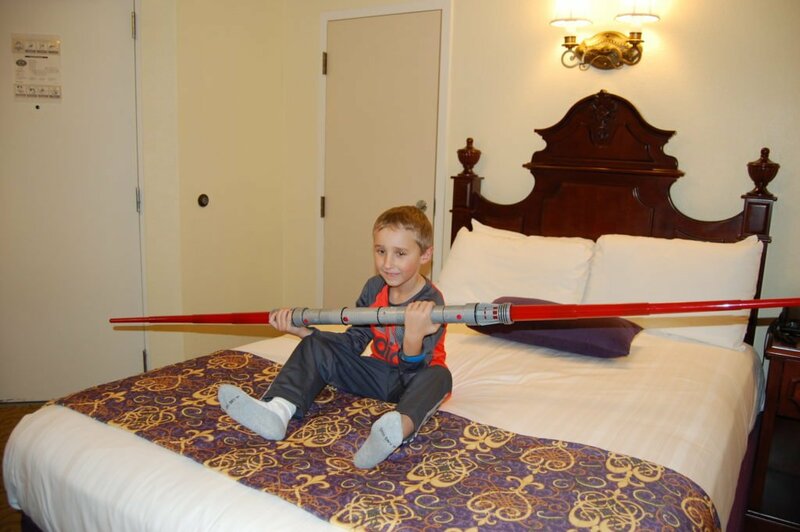 You can never underestimate how important light sabers are to Star Wars fans, especially younger fans. At the Tatooine Traders in Hollywood Studios and Once Upon a Toy in Disney Springs, you will find a make-your-own light saber station. These are a little confusing to put together, but there are cast members on hand to help. Boston has made his own light saber a couple different times. They are fun to make. They are also a unique souvenir to take home. Tip: the station in Disney Spring is less crowded than the one in Hollywood Studios. Another unique souvenir that you can only find at Disney World is the make-your-own droids. Like the make-your-own light sabers, you can find the stations for making droids at Tatooine Traders and Once Upon a Toy. These droids are small, but they come with their own plastic packaging that you can put them in after creating them. They also include stickers so you can add the name of your droid to the packaging. You can make two droids for about $15. 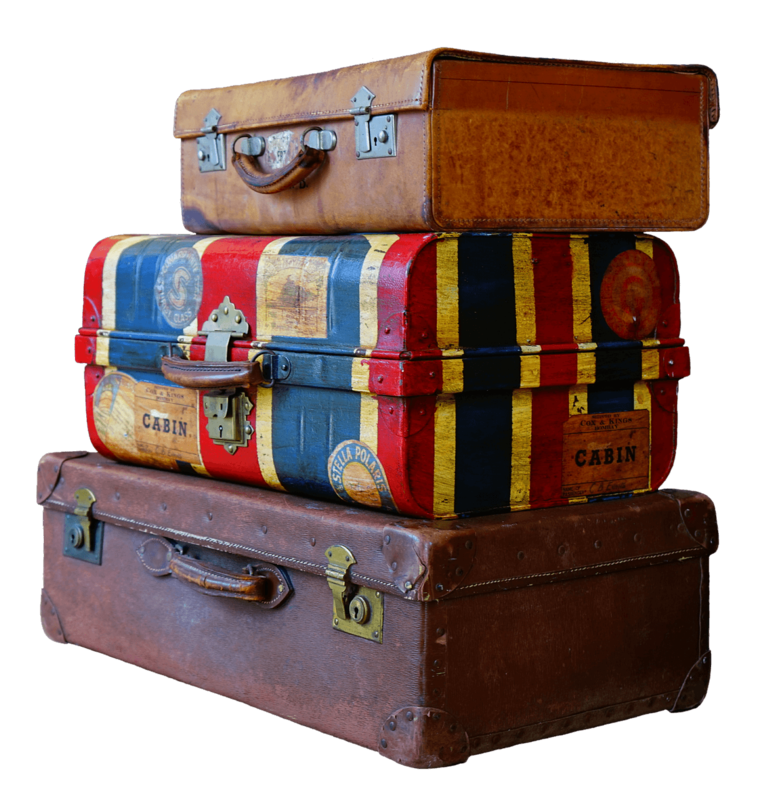 These are easy to transport home. In my opinion, they are even more fun to make than the light sabers. Every Star Wars fan needs at least one droid that they make themselves. Last but not least on this list is the Jawas. You will find them in Launch Bay roaming around. Unlike Chewbacca and Kylo Ren, the Jawas have no formal line. They just roam around freely. They will stop to take photos with you though. We have also heard that you can trade small trinkets with them. We did not try to trade with them, but did see them playing with glow sticks when we stopped to take a picture with them. They are very cute and fun to watch! While Hollywood Studios is currently in a state of transition with lots of construction going on, there are some fun things there for Star Wars fans. 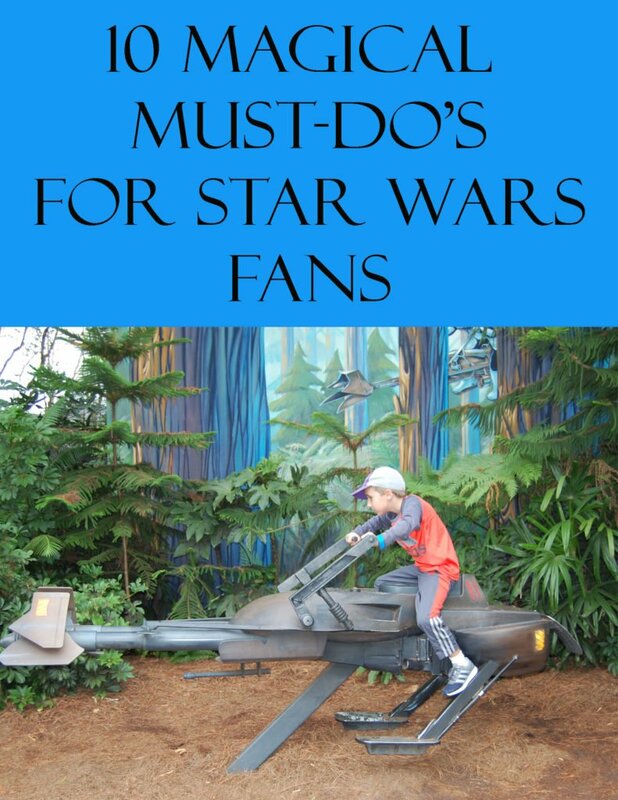 These are our 10 magical must-do’s for Star Wars fans. All of these things are currently available to experience. Once the new Star Wars land opens, I will update this list to include any of the new attractions that should be added. I hope you will share some of these attractions with your Star Wars fans. Happy travels and have a magical day.